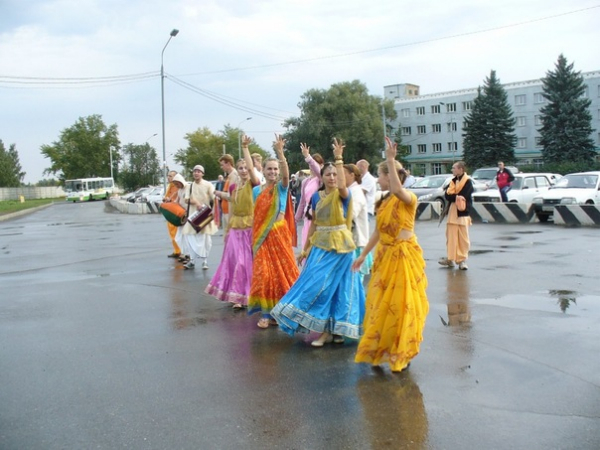 On Radhastami—September 5th—around seven hundred devotees gathered in Omsk, Western Siberia for the installation ceremony of Sri-Sri Radha-Govinda, the first ever Radha-Krishna Deities to be installed in Russia. While Omsk is already a busy temple with about 200 devotees, others also arrived from Siberia’s biggest cities Novosibirsk, Krasnoyarsk, and Irkutsk, as well as from Yekaterinburg and Chelyabinsk near Russia’s Ural Mountains, and Almaty in Kazakhstan. Meanwhile, Dayananda Swami arrived from England, and Bhakti Vijnana Swami, B.B. Govinda Swami, and Prithu Dasa flew in from Germany, where they had just attended the recent Kirtan Mela. The festival began in the early morning with an elaborate fire ceremony known as Vastu Shuddhi. 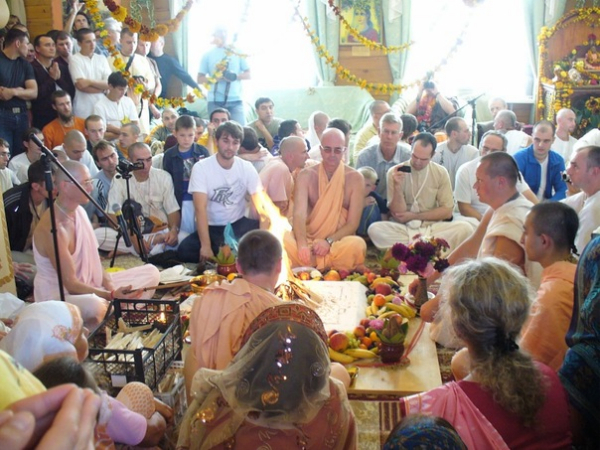 To purify the temple building and make it a suitable dwelling place for the Deities, Kishori Mohan Dasa, an expert Mayapur-trained priest from the Almaty community in Kazakhstan, performed a fire yajna and chanted sacred mantras. A long Abhisekha ceremony, in which many different items were used to bathe the Deities, followed, as did Prana Pratistha, in which priests called the Lord to personally reside and interact with His devotees through the medium of the Deity. 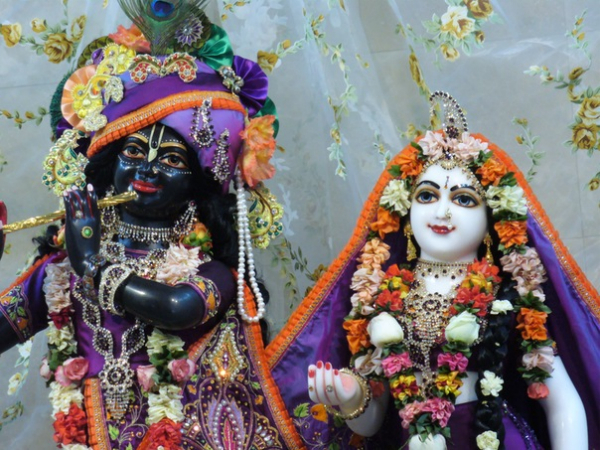 Next, around 200 different food preparations were offered, as the curtains on the new altar opened to reveal Sri-Sri Radha-Govinda, spectacularly dressed and decorated, for the first time. As everyone gazed in wonder at Sri-Sri Radha-Govinda, the main centerpiece of the installation ceremony ensued—an ecstatic kirtan led by B.B. Govinda Swami, which went on until 10 o’clock at night. A delicious feast, of course, was also served out to all the devotees. Moscow, where the first Radha-Krishna Deities were originally supposed to be installed, didn’t have its own building. 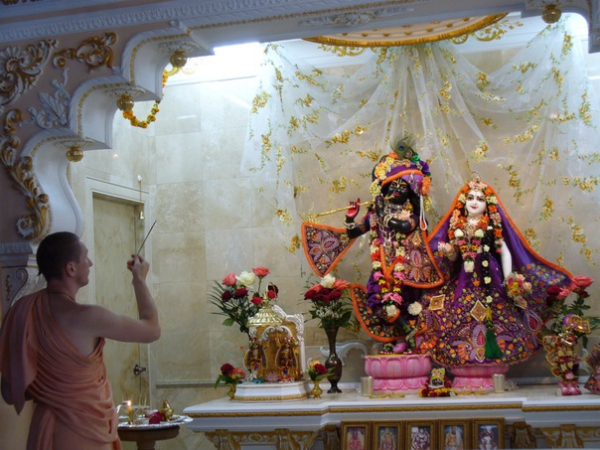 “In Omsk, however, we have our own building on our own land, and the devotees there are very mature and were very enthusiastic to install Radha-Krishna,” Bhakti Vijnana Swami explains. It all began when during a visit to India, ISKCON’s regional secretary for Omsk, a very enterprising devotee called Shikshastakam Dasa, decided to take action. He approached ISKCON guru and GBC Gopal Krishna Goswami, who agreed to sponsor the Deities. Thrilled, Shikshastakam contacted Pancharatna Dasa, temple president of the ISKCON center in the city of Jaipur—where Deities are traditionally made—to make the arrangements. But Pancharatna was unsure. “It’s very difficult to organize something like this, and to have suitable Deities made,” he said. 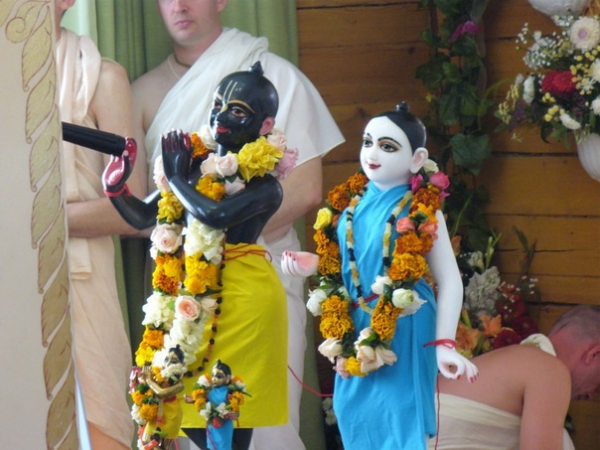 Sri-Sri Radha-Govinda were shipped to Omsk, and amazingly, arrived exactly on Sri Radha’s appearance day in 2010. Taking this as an auspicious sign that the Deities did indeed wish to be worshipped in Omsk, the devotees there set Radhastami 2011 as Their installation day, and threw themselves into the tremendous amount of work it took to make the momentous event happen. For one year, they trained cooks and priests, did all the renovation on the temple building they could with their meager finances, and prepared many beautiful outfits and decorations for the Deities. 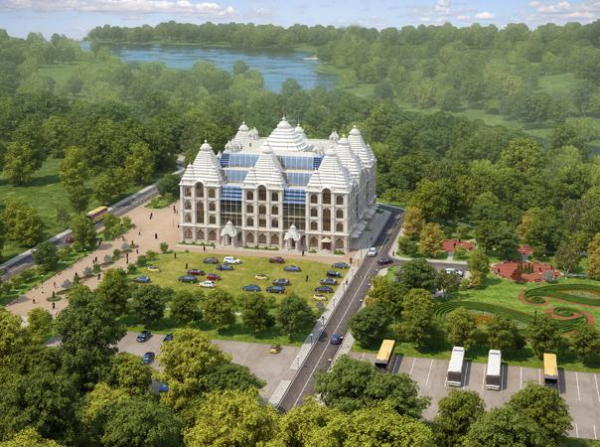 With Radha-Govinda present, the future of ISKCON Omsk is brighter than ever. The temple sits right in the center of the city, in a very under-developed district that has much future promise due to its location. Devotees therefore plan to get there first, by buying up many of the area’s cheap houses and turning it into a wonderful spiritual community. It’s the beginning of a major turning point for ISKCON Russia, where devotees are still being harassed by the government and by mainstream religious groups—recently, the Russian Federal Security Service and Orthodox Church launched a case against the Bhagavad-gita As It Is in Tomsk, another Siberian town. The temple will be located near Moscow’s Sheremetyevo International Airport, on a beautiful five-acre plot of land, full of trees and greenery, and with a river flowing through it. The building itself will be several storeys high, cover a total of 12,300 square meters, and combine modern technologies and styles with classic Indian temple arches and domes. It will include a spacious temple room for worship, accommodation for devotees and pilgrims, a center for social programs such as Food For Life, an auditorium, an educational center, a Vedic library, and an Ayurvedic hospital.